Handbags, glad rags and elf hats at the PK quiz night! At PK Education, we believe in giving back as much as we can… and having a great time. 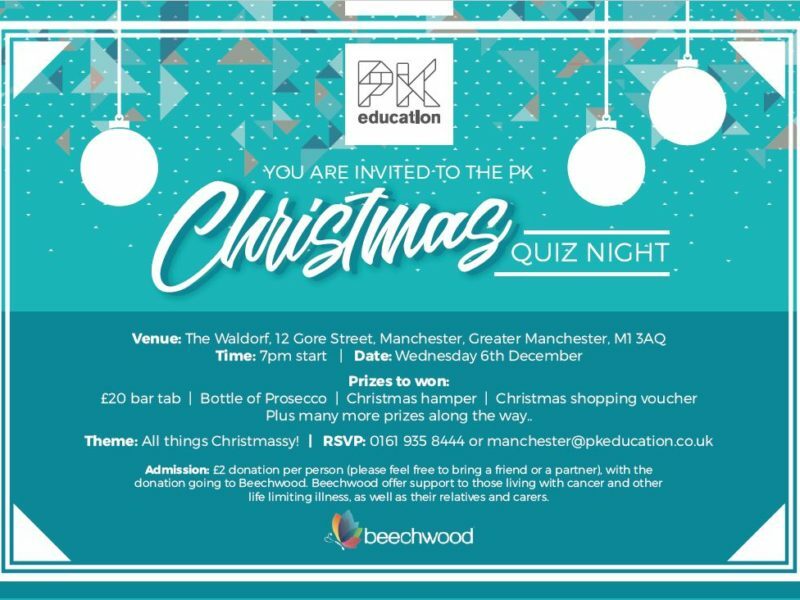 So, with that in mind, we’re pleased to invite you all along to the PK Christmas Quiz Night! On Wednesday 6th December from 7pm, we invite you all to come along to The Waldorf in Manchester, a stone’s throw away from our offices, to join us for an evening of festive fun. All in aid of Beechwood, we’re aiming to raise as much money as possible for an organisation close to the hearts of several of our staff members. Beechwood offer support to those living with life limiting illness, as well as their relatives and carers. We’ll have prizes to be won on the night that include prosecco, Christmas hampers, shopping vouchers, and bar tabs, just in case the season of goodwill wasn’t enough to entice you on its own! This is a great opportunity for us to catch up with all of our supply teachers, supply staff, schools… and for us to extend the PK family further. This event is open to everyone – we’d love to see some new faces, and look forward to spreading some festive cheer. Don your elf hats, those dashing Christmas jumpers, or your glitzy partywear, and help us to raise some money and have some fun. To book your place please get in touch with our Manchester team on 0161 935 8444 or email manchester@pkeducation.co.uk . Admission will be a £2 donation with all monies donated to Beechwood.